Like it or not, we live in the age of annoyance. Technology, electronic communications, gadgets, airline travel - as it all gets easier, it also seems to get exponentially more annoying. Annoyance is described as an unpleasant mental state that can lead to emotions such as frustration and anger. Sound familiar? When was the last time you yelled at your "stupid computer" or got frustrated that your smartphone could not find a signal? 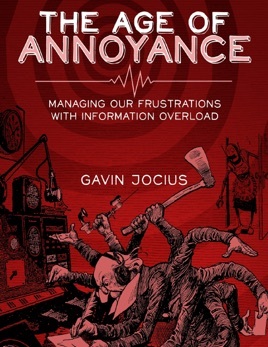 "The Age of Annoyance" is designed to help people make sense of the crazy world we now live in and better understand why we seem to lose control so easily when dealing with technology. Well written story around some of the many factors around the annoyance of technology. Gavin does a great job of weaving news events to document how technology can be helpful while also identifying pitfalls associated with an influx of information. Would recommend this book to anyone in digital marketing.